Marcus Smart #36 of the Boston Celtics, Evan Turner #11, Isaiah Thomas, Tyler Zeller #44, and Jae Crowder #99 gather during the fourth quarter of Game Six of the Eastern Conference Quarterfinals against the Atlanta Hawks during the 2016 NBA Playoffs at TD Garden on April 28, 2016 in Boston, Massachusetts. 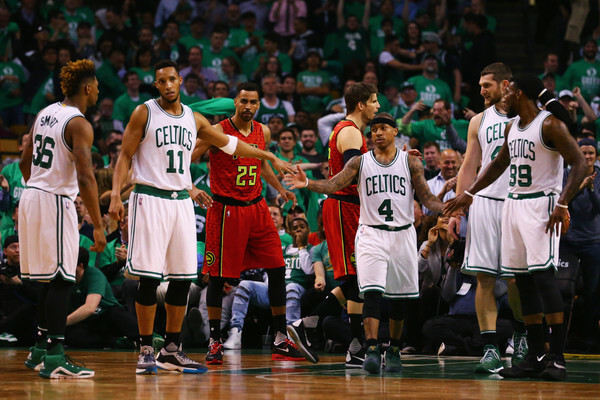 The Hawks defeat the Celtics 104-92. NOTE TO USER User expressly acknowledges and agrees that, by downloading and or using this photograph, user is consenting to the terms and conditions of the Getty Images License Agreement.